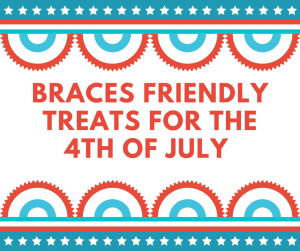 Even though you or your child have braces, everyone should be able to indulge in holiday themed treats. The following treats are sure to please everyone whether your having a small celebration at home or a full blown backyard barbecue. Place a banana slice at one end of the kebab stick, then a blueberry and then a raspberry. Keep layering the fruit. Leave enough room at the end of the kebab so that you can hold it. If you want to get really creative, layer the kebabs so that you form an American Flag and display it on a serving tray. that will surely impress any guest. If you want to be a little less healthy, you can switch out the banana slices for marshmallows. 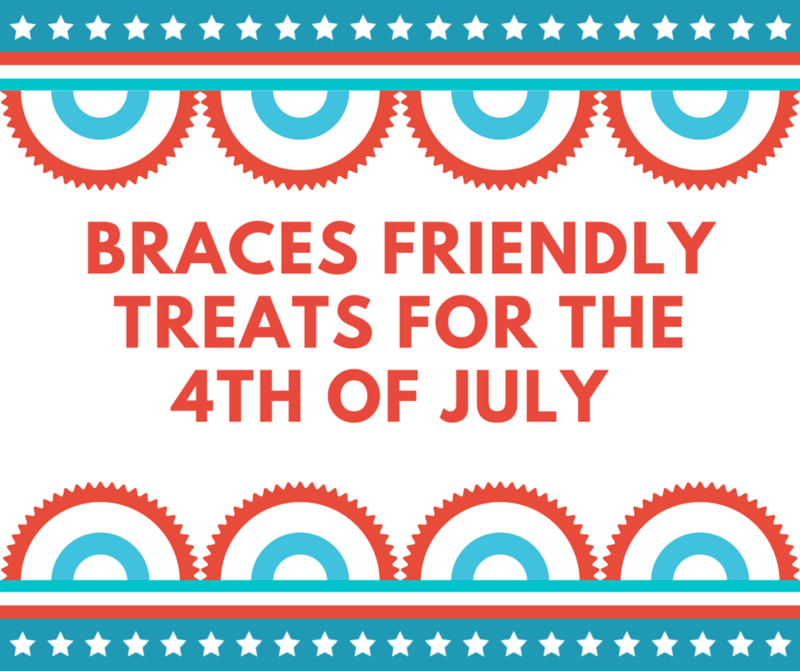 Everyone loves cupcakes and cookies which are easy to eat even when you have braces. To keep kids entertained during a backyard barbecue set up a cupcake or cookie decorating area. Kids can decorate their favorite dessert using red, white and blue icing then devour their delicious masterpieces. Instead of buying icing already in the tube, you can fill smaller sandwich bags with a ½ cup of icing and cut off the tip of a corner so kids can use the bag as a decorating tool. Great for kids and adults, sno-cones help you stay cool in the summer heat. All you need is shaved ice and cups to serve them in. A quick, easy way to get shaved ice is to chop it ice up in your blender. You can either buy the syrup or make it at home by combining two parts fruit juice to one part water. Kraft offers an easy to follow Firecracker JELL-O pop recipe. This recipe layers blue, white and red flavored JELL-O with a cherry to look like a firecracker. In an ice cube tray, fill the spaces with red and blue fruit. You can use strawberry slices, raspberries or blueberries. Then add water and freeze. Use the ice cubes in a glass of water for a refreshing fruity flavor. To make the ice cubes even more festive use an ice cube tray that has star shapes like this one from Bed Bath & Beyond. For additional ideas check out the July 4th page on Pinterest.